Poltergeist is a film that provides nearly as much intrigue off-screen as it does on. Foremost is the so-called "Poltergeist curse", named that because of the premature deaths of young actors Heather O'Rourke and Dominique Dunne. However, don't forget that Craig T. Nelson went on to play Coach for years; that has to have been part of the curse, doesn’t it? One other intriguing concept involved in Poltergeist relates to who directed the film. The credits say Tobe Hooper - end of story, right? Well, no. For years, stories have persisted that Steven Spielberg actually directed much of the movie. The rumors state that Hooper wasn't getting the job done, so since Spielberg was already there as screenwriter and co-producer, it didn't take much to make him take over the reigns. Spielberg has repeatedly denied that this was the case, but when I watch the film again, I find it hard to believe otherwise. From top to bottom, Poltergeist looks like a Spielberg film. Yes, as producer and writer he obviously played a strong role in the production and his influence would have been felt even if he never stepped on the set, but this case goes beyond that. Too much of the movie simply looks and moves like a Spielberg-directed film. The framing, the camera moves – checkout the frequent use of Spielberg's trademark zooms in on characters - the pacing, the treatment of the environment… if Spielberg didn’t direct this sucker, then Hooper sure did a great impression. Well, whoever actually helmed Poltergeist did a very good job. The film works tremendously well on many levels. Some might view it as "horror lite" since it lacks the graphic violence and high body counts of most horror films. Indeed, the film contains zero deaths. I disagree with that assertion that it’s a kiddie version of a horror movie, though. Films don't need buckets of blood and multiple decapitations to provide some scares. Poltergeist offers thrills, shrieks, and creeps galore, all while maintaining a "PG" rating, though it would probably be a "PG-13" these days; that rating didn't exist in 1982. 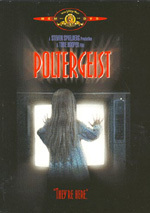 Poltergeist appears in an aspect ratio of approximately 2.35:1 and in a fullscreen edition on this double-sided, single-layered DVD; the widescreen image has been enhanced for 16X9 televisions. Only the 2.35:1 image was examined for this review. As one of the earliest DVDs produced, I didn’t anticipate a lot from the image. While it showed some good points, the end result lived down to my low expectations. Sharpness varied. Many parts of the film showed pretty solid definition, but many exceptions occurred. Wider shots tended to be loose and soft, and some closer images also appeared that way. This wasn’t a picture with terrible delineation, but it could show a lot of improvement. Mastering and compression weren’t so hot back in 1997, especially when they packed a nearly two-hour movie onto one layer. Problems cropped up due to a “digital”, unstable look to the film. I noticed lots of jagged edges and shimmering, and some light edge enhancement also occurred. The movie simply lacked the stability that would have come with better encoding. Above and beyond those problems, I noticed a fair number of source flaws. The movie suffered from white specks and spots along with some grit and grain. These tended to pop up in batches, so many parts of the flick came with few to no distractions. However, when they occurred, they could become pretty heavy. Colors acted as a relative highlight. On occasion, they looked slightly heavy, but the hues usually came across as vivid and lively. Blacks were reasonably tight, but shadows were a little dense. Some low-light shots seemed fine, but others could be a bit too thick. All of this added up to a disappointing transfer. I almost gave it a “D+”, but I thought it offered enough strengths to earn a “C-“. At least the Dolby Digital 5.1 soundtrack of Poltergeist provided more consistent pleasures. The soundfield gave us a nice setting. Music showed solid stereo imaging, and effects broadened the spectrum well. Elements like thunder roared from all around the room, and pieces such as spirits also cropped up in logical spots. The components blended together in a fairly smooth manner to create a fine sense of action in all five speakers, though the forward area dominated. Unfortunately, Poltergeist skimped on extras. It included the movie’s trailer and nothing else. Given the film’s controversial production history, that’s a disappointment, but at least Poltergeist itself remains a winner. This is an innovative, clever horror flick that continues to engage after 25 years. The DVD provides very good audio but suffers from insubstantial extras and weak visuals. Though I like the flick very much, this is a problematic release.